Maintaining cool temperatures in buildings is necessary to keep people comfortable, particularly for those living in hot climates. For houses that aren’t optimized for thermal performance, cooling requires large amounts of energy and money. 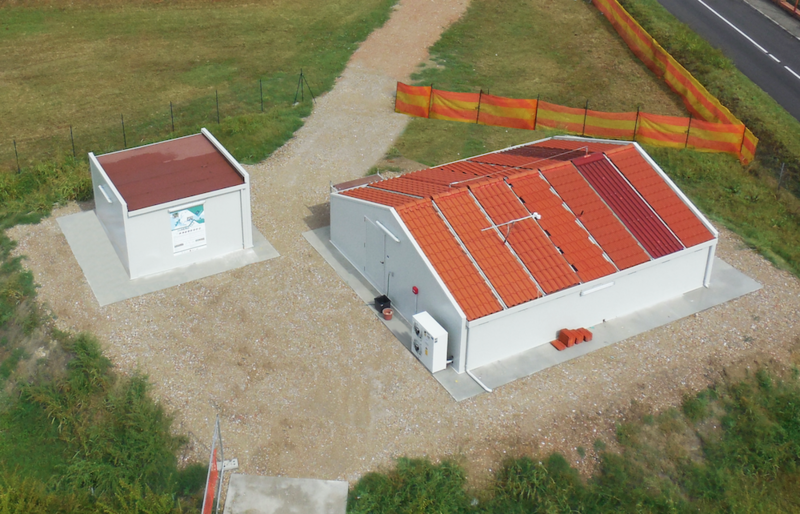 To reduce these costs, researchers from the University of Ferrara, Italy looked to improve roofs as part of the Life HEROTILE project. To accomplish this, they modeled novel roof tiles that are designed to increase air permeability and lower cooling costs. 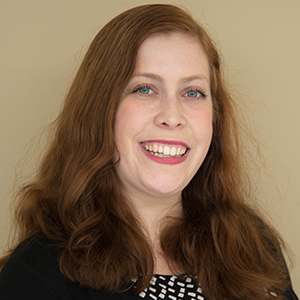 Spending time in a hot building in the summer isn’t pleasant, and depending on the temperature, it can even be dangerous to your health. This is especially true in hot climates like the Mediterranean, where large amounts of solar radiation generate hot temperatures indoors and outside. As a result, recent European environmental policies state that maximizing indoor thermal comfort while minimizing cooling consumption is a key goal. Sun hitting a roof. Image courtesy of ICP. 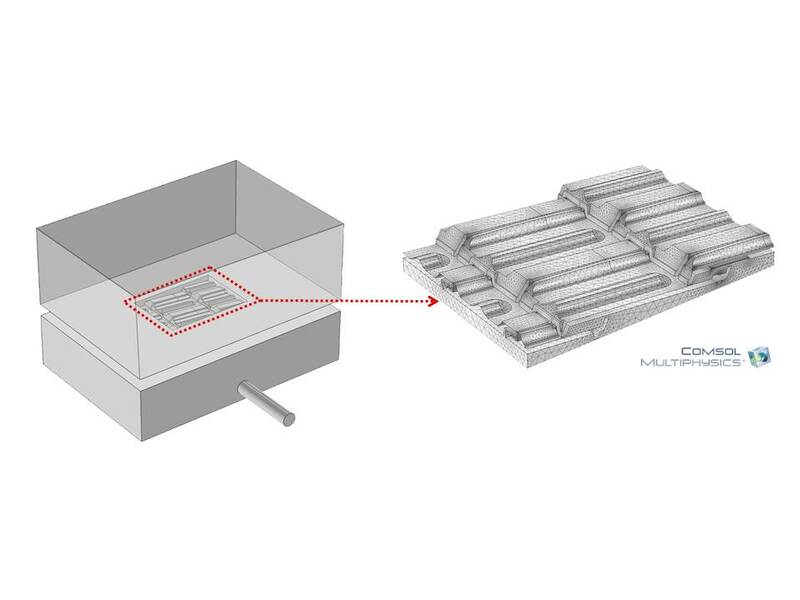 While there are many strategies for enhancing the thermal performance of buildings, we’ll focus on optimizing roofs. To understand why roofs are important, picture a house on a sunny day. As solar radiation beams down from above, it hits the roof on top of the building. The heat transfers through the roof’s surface, causing the house to heat up. This effect is amplified because a roof has a larger surface area than other parts of a building. Also, its angle of incidence is conducive to being struck directly by the sun’s rays, thus increasing its impact on the heat management of the entire house. Due to these factors, researchers are looking to optimize roof designs to reduce the energy required for space cooling and air conditioning. 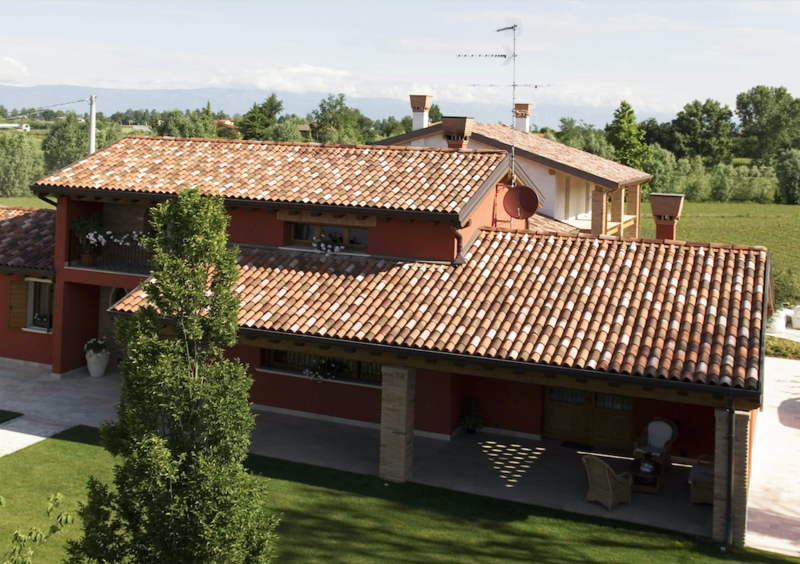 A ventilated, pitched roof made of Marsigliese tiles. Image courtesy of UNIFE. One way to reduce energy costs is to use a tilted or pitched roof along with a system of battens and counterbattens to create a ventilation layer beneath overlapping roof tiles. The ventilation layers allow air to flow from the eaves section (an intake vent) to the ridge. 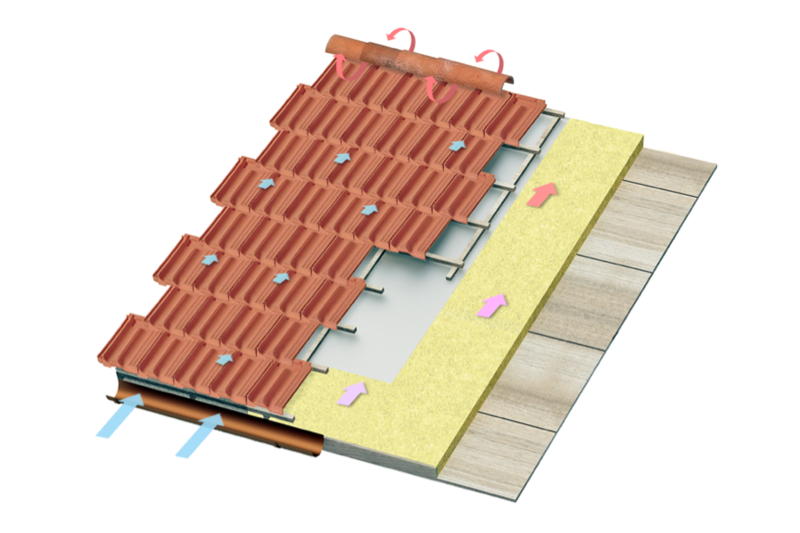 This promotes insulation to reduce heat transfer between the roof tiles and the house’s structure. It also increases heat dissipation via the airflow. Using this strategy, called above-sheathing ventilation (ASV), technicians reduce the energy required to cool a house. Further, the air permeability of the overlapping tiles also functions as another intake/exhaust air-vent system. ASV can be improved by increasing the air permeability, and thus airflow rate, between tiles. This is the goal of the European Life HEROTILE project, which seeks to enhance the energy efficiency of buildings by designing superior roof tiles. Logo for the Life HEROTILE project. While this idea came from the Department of Architecture at the University of Ferrara (UNIFE), it has expanded into the Life HEROTILE project. The project spans multiple countries and partners, such as the Industrie Cotto Possagno, Monier Redland Ltd, Terreal SAS, ACER, and ANDIL. Today, we’ll focus on a preliminary study by researchers from the University of Ferrara that analyzes the performance of novel tile shapes. 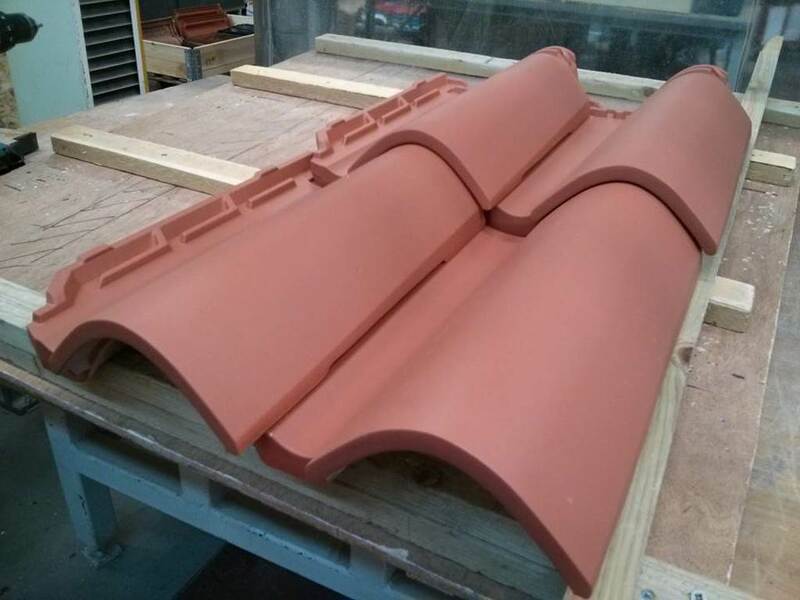 A Portoghese roof tile prototype. Image courtesy of Monier Technical Centre GmbH. The team verified the model and calibrated its parameters using experimental measurements from a highly controlled test rig. The geometry was created using a CAD package and then imported into COMSOL Multiphysics using the CAD Import Module. 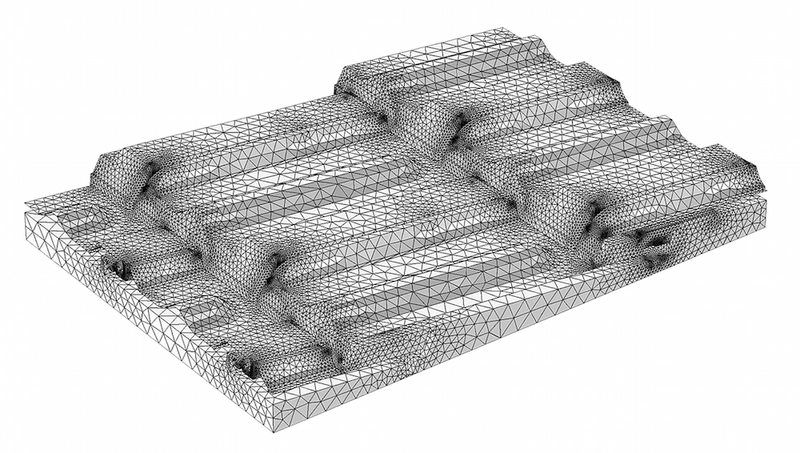 The three-dimensional CFD model was defined using incompressible turbulent flow, which describes the airflow from the wind through the tiles. Left: The modeling domain in the study consists of four unsealed tiles in the test rig and their equivalent borders. Right: Mesh details of the modeling domain. Images courtesy of UNIFE. Let’s focus on one design in particular: a novel Marsigliese roof tile featuring a higher sidelock and new headlock pattern. 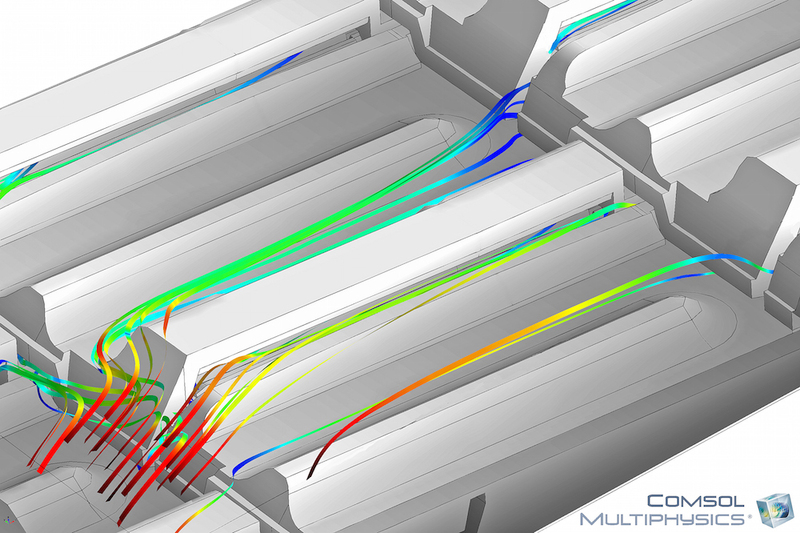 Using the CFD simulation, the team ran parametric studies to analyze the airflow variations passing through the tile at various incident wind speeds and directions. Marsigliese roof tile models. 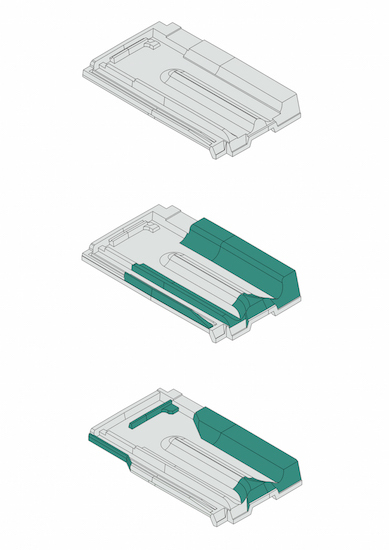 Green indicates the design variations. Images courtesy of UNIFE. Together, they studied a total of 30 different wind condition scenarios. They also compared how the tiles reacted to changes in air pressure drops and volumetric flow rates through the tiles. 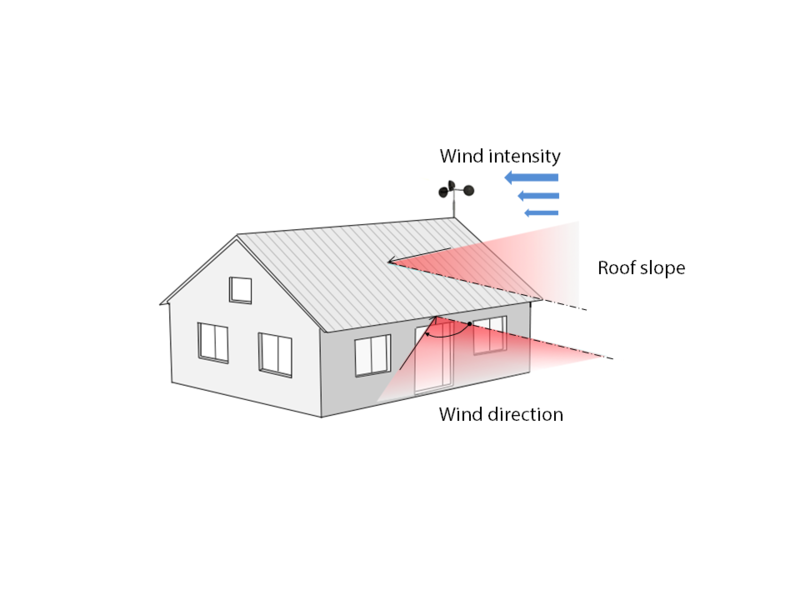 The researchers studied a variety of roof slopes, wind intensities, and wind directions. Image by the research team and taken from their COMSOL Conference 2016 Munich presentation. The team noted that when horizontal wind angles changed from blowing directly up the roof slope to blowing sideways, the airflow rate increased for the novel design and decreased for the standard Marsigliese design. By investigating the pressure difference between an external and internal point probe, the UNIFE team also found that the airflow rate of the standard tile design diverged clockwise, while the new shape diverged counterclockwise. Velocity magnitude surrounding the roof. Images taken from Bortoloni et al., Summer Performance of Ventilated Roofs With Tiled Coverings, 34th UIT-Heat Transfer Conference, Ferrara, 2016. Further results confirmed that the new Marsigliese tile shape generates higher airflow rates than the standard shape due to the new sidelock geometry. This form acts like an intake vent, increasing airflow through the tile’s side. The airflow streamlines on the roof tiles. Image courtesy of UNIFE. As for air permeability, when compared to the standard shape, the novel shape and headlock pattern increase air permeability by up to 100%. As such, the researchers achieved their goal of designing an innovative tile shape that offers improved air permeability. Novel roof tile designs can help reduce the significant environmental and fiscal costs that come with indoor air conditioning. The UNIFE team considers “the first phase of the project a success” and that the “results of [the] COMSOL [Multiphysics] simulations had [a] strong effect” on the project. For instance, using this research, the Life HEROTILE project began real-scale testing of their designs as part of their Action C.3 phase. In this phase, the team plans to evaluate the energy and waterproofing performance of their novel tile designs and compare them to standard tiles and other types of waterproof materials. The roof tile testing site in Ferrara, Italy. Image courtesy of the University of Ferrara. The team is collecting data from two monitoring stations at climate-appropriate mock-ups in Ferrara, Italy and Yeruham, Israel. Each of these mock-ups consists of two buildings, one with a pitched roof and the other with a flat roof. The pitched roof is divided into sections with different coverings. In the Ferrara mock-up, there is a section for the standard Marsigliese tiles as well as the new HEROTILE Marsigliese tiles discussed in this blog post. This mock-up is also equipped with the standard Portoghese tiles and the Portoghese version of the new HEROTILE tiles. At this stage, the team hopes to create a comprehensive database of experimental tests to match their simulation data.